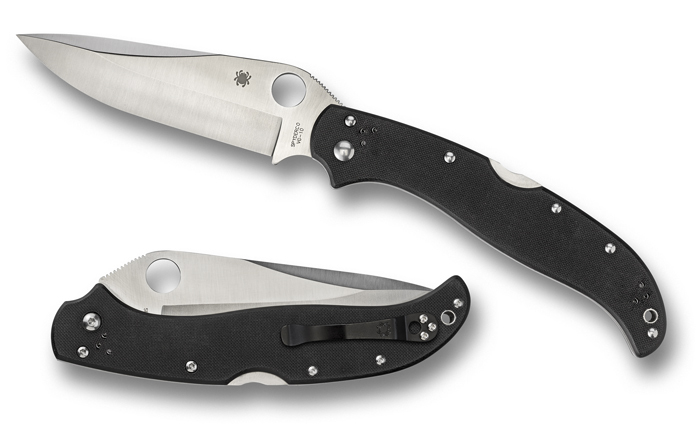 Description: Spyderco’s biggest folder to date, featuring a new lock called the “PowerLock”. The lock is designed for a super-sized folders, and looks like a standard backlock at first blush, but features a secondary cam mechanism that is actuated by the back-lock lever. This is one that will easily take on the Cold Steel Voyager XLs! This entry was posted on Wednesday, November 12th, 2014 at 4:03 pm	and is filed under Designer - Sal Glesser, Features - Screw Construction, Handles - G10, Lock - PowerLock, Manufactured - Japan, Steel - VG-10, Type - Folding Knife. You can follow any responses to this entry through the RSS 2.0 feed. You can leave a response, or trackback from your own site.